Tv series have flooded the market lately and companies in the video streaming industry are creating more content in a race against becoming irrelevant. The content comes predominantly wrapped in the form of tv series (episodes, seasons) to attract as many users as possible and keep them hooked for as long as possible. We now want to binge watch television in the era of Netflix, Hulu, HBO and because this is the new norm, we no longer consume one episode each week, impatiently waiting for the next one next week. No, we now write-off entire weekends, binge watching full seasons, episode after episode. 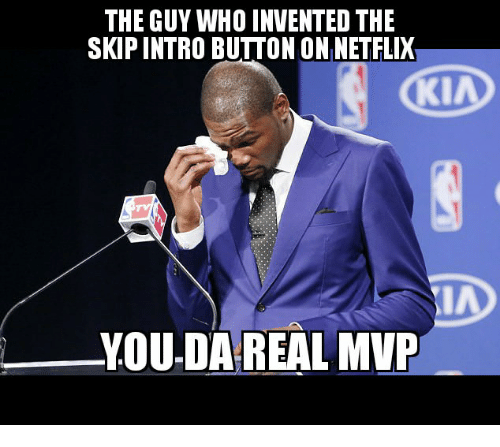 Netflix clearly heard the calls for reform and introduced a “skip intro” button to help with our ‘addiction’. But what happens when the ‘skip-intro’ becomes more than just that? What happens when it morphs into something else, outside of Netflix and starts impacting other areas of our lives even without us realising it? What happens if we start wishing for a ‘skip-intro’ button for real things such as career, relationships, health etc.? Maybe you haven’t noticed it but that already happened. They exist. We live our lives on fast-forward and we tend to have ‘skip’ buttons for everything we do. Take for example relationships and dating. We live such busy lives that we are now looking for the ‘right one’ by swiping right. Technology has gone and screwed everything right up. Now dating is just a numbers game. We swipe right in a desperate desire to ‘skip over’ the troubles of letting life run its course by fast forwarding one or two or three first dates. And when it doesn’t ‘work out’ we come up with stupid excuses such as ‘we wanted different things’ instead of blame ourselves for not putting the effort in the first place. The same happens to our careers. There are numerous studies that show a complete lack of work-place engagement among millennials who are notoriously known for ‘job hopping’ in a quest for bigger rewards. We ‘skip’ over jobs or ‘skip’ over putting in ‘the work’ because we think we are entitled to more and we have no patience for letting our career follow its natural course. We try to skip or by-pass critical growth stages by doing a training, reading a book summary (not even the book! ), investing the proverbial ’20 hours’ to acquire a new skill and then we believe we are entitled to higher pay-checks, bigger rewards, more responsibilities losing track of the fact that we haven’t put in sufficient effort to actually earn it. Last formidable example is health. There are tons of diets and programs that promise ‘six packs’ within 12 weeks, or magic 7 minute workouts, or a magic pill that allows us to eat as much as we want. And we fall for them, every, single, time! And we fail miserably (every single time!) because we were promised a ‘skip button’ that was supposed to take us straight to the reward — those ‘six packs’ but hasn’t. These are some simple real-life examples on how we have employed mechanisms to ‘skip’ essential, necessary stages of our lives that have disastrous consequences on the long run. Every time you click the ‘skip ’ button you should realise that by doing that, you are actually unconsciously supporting the development of a very dangerous habit that has serious implications in real life and will likely only lead to disappointment and frustration at the end.